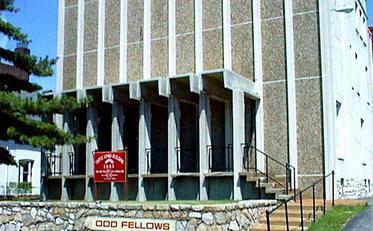 The Independent Order of Odd Fellows is one of the largest and oldest fraternal orders in the United States. Odd Fellowship was founded in England where it grew up during the 18th century. The Patriotic Order in England was followed by the Union of United Orders and the Loyal Order. In 1813, various lodges of the Union Order organized the Manchester Unity of Odd Fellows. American Odd Fellowship was founded as the Washington Lodge #1 in Baltimore in 1819, and the following year affiliated with the Manchester Unity. The three links of Odd Fellowship's symbol represent Friendship, Love, and Truth. party on July 19, 1964 to celebrate it. In 17th century England, it was odd to find people organized for the purpose of giving aid to those in need and of pursuing projects for the benefit of all mankind. Those who belonged to such an organization were called "Odd Fellows". Odd Fellows are also known as "The Three Link Fraternity" which stands for Friendship, Love and Truth. among all peoples and nations.